Little Rock started functioning as the capital of Arkansas in June 1821. But by 1825 the settlement known as Little Rock was little more than a loosely defined group of structures. One hundred and ninety-three years ago today, on October 27, 1825,Territorial Governor George Izard signed legislation which started establishing a framework for Little Rock to function as a city. Peay bought the tavern from Watkins in 1826 and continued in the tavern and hotel business the rest of his life. He later served on the Little Rock City Council and was acting mayor. His son Gordon Neill Peay served as Mayor of Little Rock. The Peay family also cofounded Worthen Bank and Christ Episcopal Church. Members of several branches of Mr. Peay’s descendants including the Worthen and Hurst families remain active in Little Rock affairs. On Monday, January 2, 1826, Little Rock voters elected their first Board of Trustees. This five member governing body was authorized by the Arkansas General Assembly in October 1825. The five men getting the most votes were Bernard Smith, Isaac Watkins, James C. Collins, Ezra Owens and Sam C. Roane. The evening of the election, the Board of Trustees held their first meeting. They chose Mr. Smith (a former US Congressman from New Jersey) as the president. To serve as the clerk, the men selected Jesse Brown, who was Little Rock’s first school teacher. In June 1826, Robert Crittenden was appointed to fill out the remainder of Mr. Owens’ term. The latter had resigned, though media accounts do not indicate why. Mr. Smith, whose job was as secretary to the governor of Arkansas, would serve on the Board through 1828. Mr. Watkins served until his murder in December 1827. Mr. Collins served in 1826 and again in 1828. Mr. Roane only served in 1826. Mr. Crittenden served a full term in 1827 and then again in 1830 and 1831. The Little Rock Board of Trustees was disbanded with the January 1832 election of Little Rock’s first mayor and aldermen. 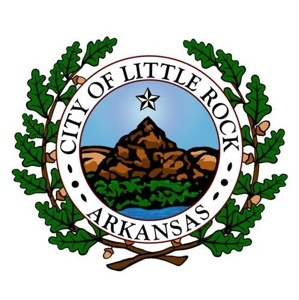 Little Rock started functioning as the capital of Arkansas in June 1821. But by 1825 the settlement know as Little Rock was little more than a loosely defined group of structures. 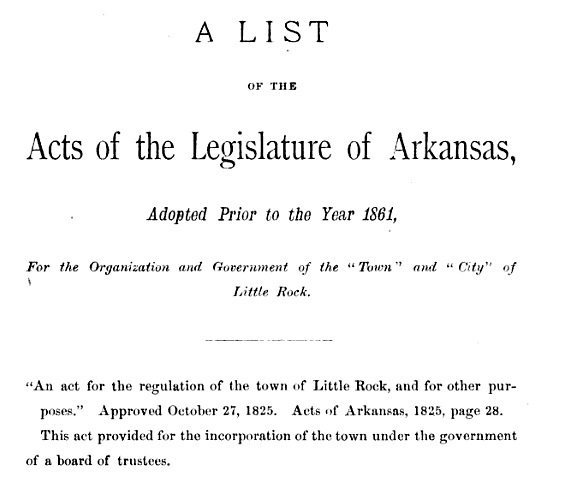 One hundred and ninety years ago today, on October 27, 1825,Territorial Governor George Izard signed legislation which started establishing a framework for Little Rock to function as a city. Little Rock started functioning as the capitol of Arkansas in June 1821. But by 1825 the settlement know as Little Rock was little more than a loosely defined group of structures. One hundred and eighty-nine years ago today, on October 27, 1825,Territorial Governor George Izard signed legislation which started establishing a framework for Little Rock to function as a city. Peay bought the tavern from Watkins in 1826 and continued in the tavern and hotel business the rest of his life. He later served on the Little Rock City Council and was acting mayor. His son Gordon Neill Peay served as Mayor of Little Rock. The Peay family also cofounded Worthen Bank and Christ Episcopal Church. Nicholas Peay’s great-great grandson Joseph B. Hurst, Sr. served on the Little Rock City Board from 1967 to 1970. Mr. Hurst’s daughter-in-law, Stacy, is currently on the City Board. Little Rock was designated as the capitol of Arkansas in 1821. But by 1825 the settlement know as Little Rock was little more than a loosely defined group of structures. One hundred and eighty-eight years ago today, on October 27, 1825, Territorial Governor George Izard signed legislation which started establishing a framework for Little Rock to function as a city. Peay bought the tavern from Watkins in 1826 and continued in the tavern and hotel business the rest of his life. He later served on the Little Rock City Council and was acting mayor. His son Gordon Neil Peay served as Mayor of Little Rock. The Peay family also cofounded Worthen Bank and Christ Episcopal Church. Nicholas Peay’s great-great grandson Joseph B. Hurst, Sr. served on the Little Rock City Board from 1967 to 1970. Mr. Hurst’s daughter-in-law, Stacy, is currently on the City Board.